150cc엔진용 오일 캐치 탱크 꺼내입용 태핏 커버를 품질 개량하는 내측 M8호스용으로 변경했습니다. 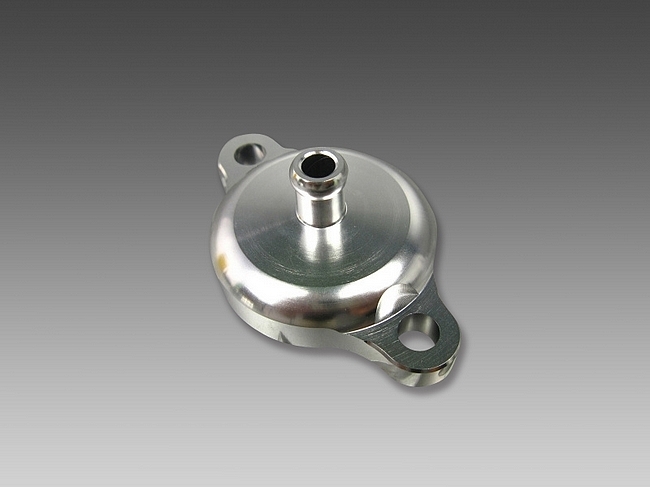 The Tappet Cover is changed for the quality improvement and inner diameter M8 Hose for the 150cc Engine Oil Catch Tank Outlet Port. It corresponds to LIFAN 125cc/150cc Engine. The Corresponding Hose Inner Diameter 8mm. This product is a high quality of Minimoto original product. 125cc Engine Cell Starting Type without Clutch Lever No. 314, Universal Racing Type 150cc Engine No. 316. This Minimoto tappet breather valve cover is perfect. Looks awesome and really dresses up your cylinder head. Best of all, it reduces and vents out overpressure to keep the engine running healthy. Perfect to combine with a catch tank, that will collect hot oil vapor and cool it before it's sent back to the engine.